Triple Elvis Sold - Misc. The works by Andy Warhol "Triple Elvis" and "Four Marlons" were sold for $151.5 million at the auction of postwar and modern art hosted by Christie’s auction block in New York. Elvis Presley portrait created by Warhol in 1963 especially for Ferus Los Angeles gallery exhibition was sold for $81.9 million. 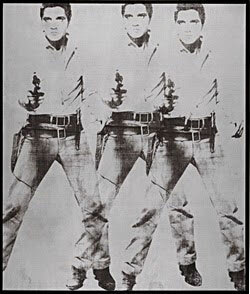 The painting of over 2 meters high performed in Warhol’s technique of serigraphy was copied from a poster for the film "Flaming Star", 1960, showing Presley as a cowboy armed with a hip. The triple repetition of the image was used by Warhol to create an effect of a zoomed-in film fragment, said at Christie’s. Marlon Brando portrait, 1966, was sold for $69.6 million. The famous American actor is depicted as Johnny Strabler – main character of the film called The Wild One, released in 1953. Warhol was a big fan of this movie. The paintings were expected to bring a total of $130 million.